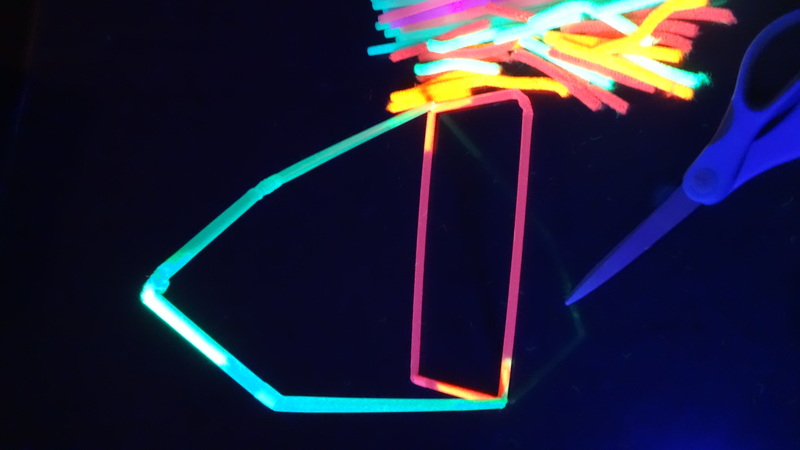 Glowing Construction with Straws and Pipe Cleaners. My boys are such avid, little builders, they are happiest when they are building with Lego, blocks, connecting toys or anything they can use to build structures and towers, etc. They love being imaginative, designing, constructing and then playing imaginatively with ther=ir wonderful inventions, it allows them the freedom to use their engineering skills, logical thought, fine motor skills, problem solving skills and their imagination. Best of all, it keeps them happy and engaged for ages too, which allows me time to get dinner made or other chores while they are so busy at work. They also ADORE glow in the dark activities, so I wanted to come up with a way to combine their two most favourite loves and came up with this!! 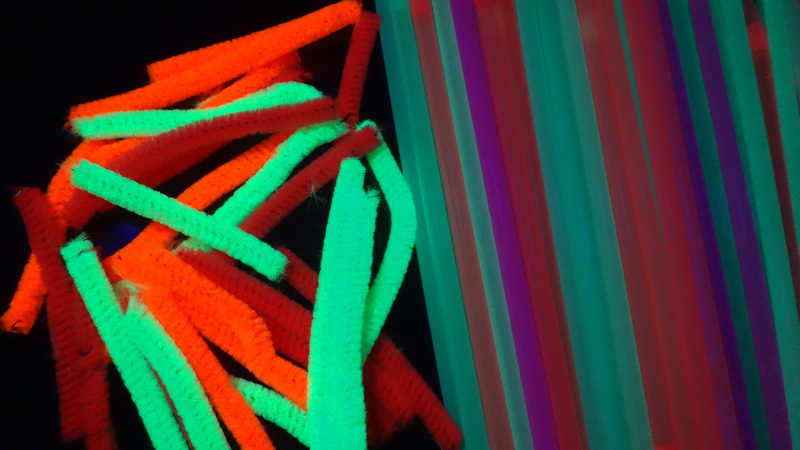 The neon pipe cleaners glowed like crazy! They almost glowed like real glow sticks!! 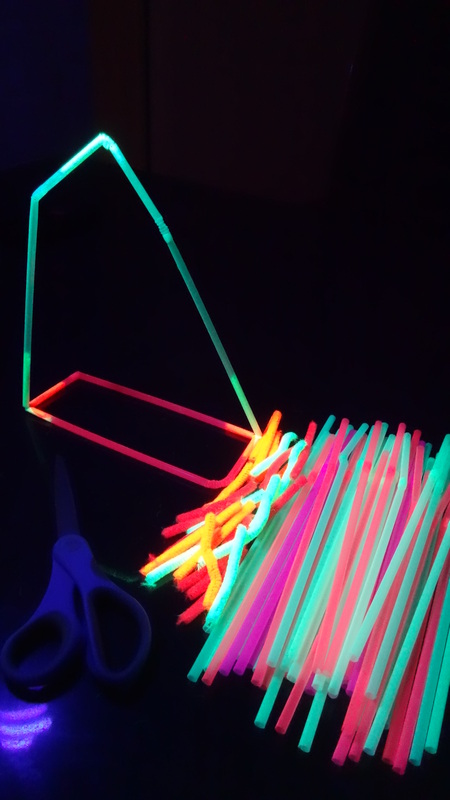 Scissors, Neon Drinking Straws and Neon Pipe Cleaners. A lamp with black light globe. Then all they need is their imaginations! I set the black light up over the boys work surface, our surface was on the table with a black tablecloth underneath so that the glowing effect would look more vibrant! I then asked my boys to cut the pipe cleaners in to 8cm lengths, and then showed them how to join the straws together by inserting one of the pieces of glowing pipe cleaner halfway in to the end of one straw and the other half of the pipe cleaner in to the other end of their next straw to join them together. You could bend the pip cleaner at this join or keep it straight if you wish. I then demonstrated how if you wanted to build a structure that also went up vertically, that you could then insert another length of pipe cleaner in to the same straw join but bend the other half of the pipe cleaner upwards to put in a straw that would then stick right up vertically. Then I let them be guided by their own imaginations and they came up with the most wonderful ideas!! They made “race tracks” with them, towers with them, plain shapes with them and even little houses with them. They had such a fantastic time and this kept them busy for ages, they only stopped playing with it when I ran out of neon pipe cleaners! Whoops! Must get two packets of them for next time I think! I actually forgot to get photos of their final creations as I found myself getting a tad too enthusiastic with this and before I knew it I was making things with it too, and then afterwards realised I was having so much fun I forgot to take more photos of the process! Whoopsie!! Never mind, we had quality time and fun together being all involved and engaged in the same project, it was so nice just playing with them and having fun, however at the expense of more photos to show you! Sorry! This was such a cheap, easy and super fun and engaging activity and I loved how much thought had to go in to balancing their structures and how to shape them properly, etc. My boys loved it and I hope that your children love it just as much as mine did! 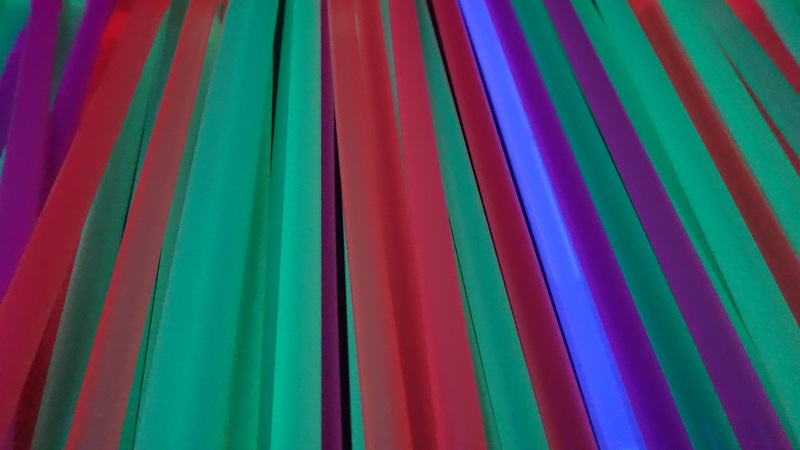 This entry was posted in Fun for Kids and tagged black light, black light globe, construction, glow in the dark, lack light, neon drinking straws, neon floursece, pipe cleaners. Bookmark the permalink. ← Chocolate Marshmallow Spiders. Fun recipe for Halloween! I had no idea these things even existed! I now have a whole bunch of ideas for my next birthday party! Thank you so much for the article!